Mills Mill in Greenville was founded by Captain Otis P. Mills as the keystone to his Mills Manufacturing Company, which he formed around 1895. Construction on the mill began in 1896, and in 1897 the factory was operating with 5,000 spindles and 200 employees. By 1903 the mill, which specialized in cotton sheets, twills, and satins, boasted 27,000 spindles and employed more than 500 workers. Mills built a neighboring mill village for his employees, which included not only housing but also two churches, a public library, and even a YWCA. Captain Mills died in 1915, and the mill was purchased by Alan Graham. Graham then sold the lucrative mill to the Reeves Brothers Company in 1918, which operated it for 60 years. During the height of mill league baseball’s popularity, Mills Mill supported a team as part of the Greenville Cotton Mill Base Ball League, which was formed in 1907. The mill closed in 1978 and sat vacant for many years before being converted into living space in the early 2000s. Today the former textile plant houses modern luxury condominiums. Mills Mill was one of the major mill complexes located within the city of Greenville in the nineteenth century. It was built by Captain Otis P. Mills after the formation of the Mills Manufacturing Company in 1894. The mill opened with a capacity of 5,000 spindles but was expanded to include 27,000 spindles and 740 looms by 1903. Products of the mill were fine cotton sheeting, twills and satins. The Mills company also built an adjacent mill village which included 120 houses, a YMCA, two churches and a public library. By 1903, over 500 people were employed by the Mills Manufacturing Company. In 1918 the mill was purchased by Reeves Brothers, Inc., and they operated the mill until 1979. The mill building is a three-story, brick building containing over 100,000 square feet. The exterior features round arch windows and the five-story tower has corbelled brickwork. On the east façade is a five-story square tower with arched windows and an open arcade. Two one-story, brick buildings with arched windows and a brick smokestack are also located on the property. 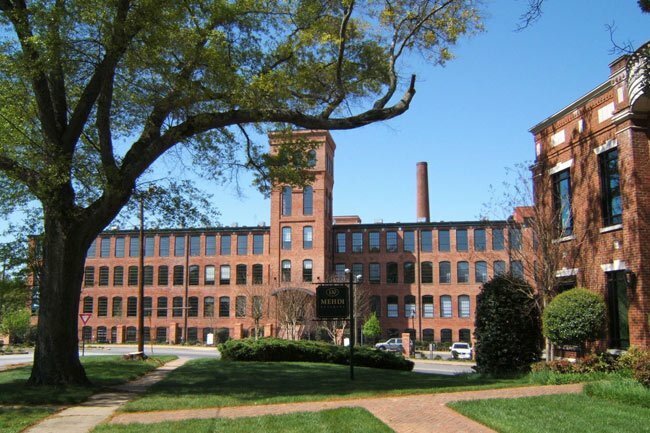 Contributor Jonathan Kostyra shares his memories of Mills Mill: “The Lofts at Mills Mill is probably my favorite building in Greenville. I grew up riding my bicycle and go-kart around the building as child, as the building had set empty for years. The mill building was a rich part of Greenville’s old textile history. The mill was built back in the late 1800s. Today, the mill has been converted to a very wonderful condo community called the Lofts at Mills Mill and its place in Greenville and heritage have been preserved!